While recent books and articles discussing Alfred Hitchcock’s work tend to focus on the production and philosophy of his iconic Hollywood-era films like Notorious (1946) and Vertigo (1958), Hitchcock Lost and Found moves beyond these seminal works to explore forgotten, incomplete, lost, and recovered productions from all stages of his career, including his early years in Britain. Authors Alain Kerzoncuf and Charles Barr highlight Hitchcock’s neglected works, including various films and television productions that supplement the critical attention already conferred on his feature films. They also explore the director’s career during World War II, when he continued making high-profile features while also committing himself to a number of short war-effort projects on both sides of the Atlantic. 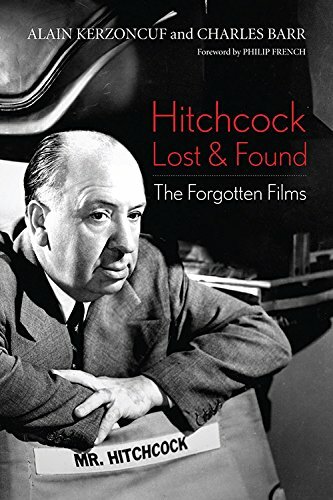 Focusing on a range of forgotten but fascinating projects spanning five decades, Hitchcock Lost and Found offers a new, fuller perspective on the filmmaker’s career and achievements. This might seem to some fans to be of marginal interest. After all, most of these films haven’t been widely seen by contemporary audiences. However, this book isn’t simply a useful tool for the Hitchcock scholar; it is a fascinating text for anyone the least bit interested in detailed ‘behind the scenes’ information about this director’s fascinating career. The obscurity of most of the films discussed only adds interest to an already enjoyable subject. The depth of Kerzoncuf and Barr’s research will surprise many Hitchcock enthusiasts. The knowledge that they provide goes much deeper than anyone might expect. There is detailed information from many documented sources to support the analysis of each film discussed in the book. This level of detail is rare even in texts about the director’s more popular work. This detail is organized into four basic units: “Before The Pleasure Garden: 1920-1925,” “The Early 1930s,” “The War Years,” and “After the War.” The first of these units focuses on Alfred Hitchcock’s apprentice years in the industry as it details each of the films that Hitchcock worked on in some capacity. It analyzes what function Hitchcock served (or likely served) on each of the films, and discusses how the work might have influenced the director (or how Hitchcock might have influenced the work). This is really no small task, and one finds themselves almost immediately intrigued. “The Early 1930s” might be this reviewer’s personal favorite unit. Here readers are guided through the torrid transitional era when British studios were scrambling to keep up with the new technological advancement of sound. Many of these films are reasonably well known (Blackmail, Juno and the Paycock, Murder), but have elements that have gone missing. New discoveries are revealed that enhance ones understanding of how these films fit into the context of Hitchcock’s career. There is also a reasonably in-depth comparison of Murder to its German sister, Mary that should interest any serious Hitchcock fan. This particular unit corrects quite a lot of previously published misinformation, and adds quite a bit of detail to the general knowledge that has already been revealed about these films. Other films from this period have been neglected by scholars. For example, Elstree Calling is finally discussed in a comprehensive manner. Kerzoncuf and Barr use documented information to discuss Hitchcock’s role in the creation of this film. This segment is especially interesting, because Hitchcock was never particularly interested in commenting on this particular film. “The War Years” is also enlightening in its discussion of Alfred Hitchcock’s participation in the creation of a number of wartime propaganda efforts in the early 1940s. Many fans are already quite aware that the director made two French propaganda shorts for the British Ministry of Information (Bon Voyage and Aventure Malgache), and both shorts are actually available on home video. However, these films were unavailable for a great many years, and a comprehensive study of the creation of these shorts has never been adequately achieved. Kerzoncuf and Barr remedy this by offering a wealth of documented knowledge that is supplemented by interviews. The most significant interview for this section was with Janique Joelle, who played a pivotal role in Bon Voyage. Joelle provides an extremely lucid and detailed account of working with the director on this short. It is one of the book’s many highlights, and is certain to delight fans and scholars alike. However, the book has much more ground to cover. The authors give an account of every known wartime project that the director worked on, including the abandoned documentary about the Nazi concentration camps (usually referred to as Memory of the Camps). “After the War” concentrates on a number of forgotten productions that Alfred Hitchcock appeared in between 1959 and 1969. Two of these efforts were “public service” efforts, and Hitchcock’s participation was mainly to lend his bankable name and image to these productions as a form of charity. The most interesting of these was Tactic (1959). This live television program was essentially a public service announcement concerning cancer diagnosis. To reveal further information here would rob you of the enjoyable experience of reading the more detailed account that appears in this excellent new text. Just when everyone thought that the subject of Alfred Hitchcock had been picked clean to the bone, we are offered this incredibly enlightening effort. Alain Kerzoncuf and Charles Barr have given fans and scholars an incredible gift. Their original research and lucid writing makes for an enjoyable reading experience. Hitchcock Lost and Found: The Forgotten Films is extremely easy to recommend without any qualifiers.